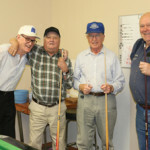 PHOTO BY JAMIE RIEGER-Harold Cook, Merle Nelson, Cor Kramer, and Don Larson enjoy some afternoon pool at the Golden Age Centre. 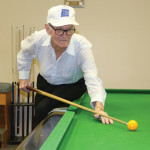 PHOTO BY JAMIE RIEGER- The group are pictured playing a game called golf pool. PHOTO BY JAMIE RIEGER-Harold Cook ignores the heckling and focuses on lining up his next shot.